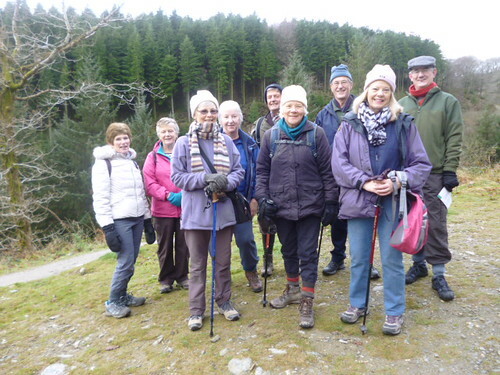 On a fine December morning a group of ten of us met at the car park in Cardinham Woods to start our 4 mile walk on the Lidcutt Valley route. It was good to see some old faces, no I don't mean old in that way but some we hadn't seen for a while. We decided to take the longer route which included the long climb up the hill, but as it says in the leaflet “we are rewarded by views over the forest” and an opportunity to have a blow whilst pretending to look at the view. 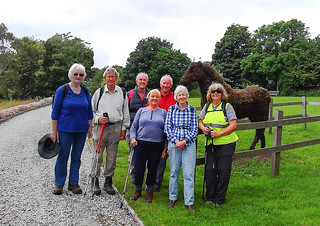 Our photographer of the day Sue then had the opportunity to take our only snap of the walk and therefore does not appear in the photo but you do have a mention in this report. After the decent and walk around Lady Vale Bridge and an increase in the number of walkers and dogs on this flat stage we head towards Woods Cafe and a stop in the tent for a welcome drink, scone or even soup. 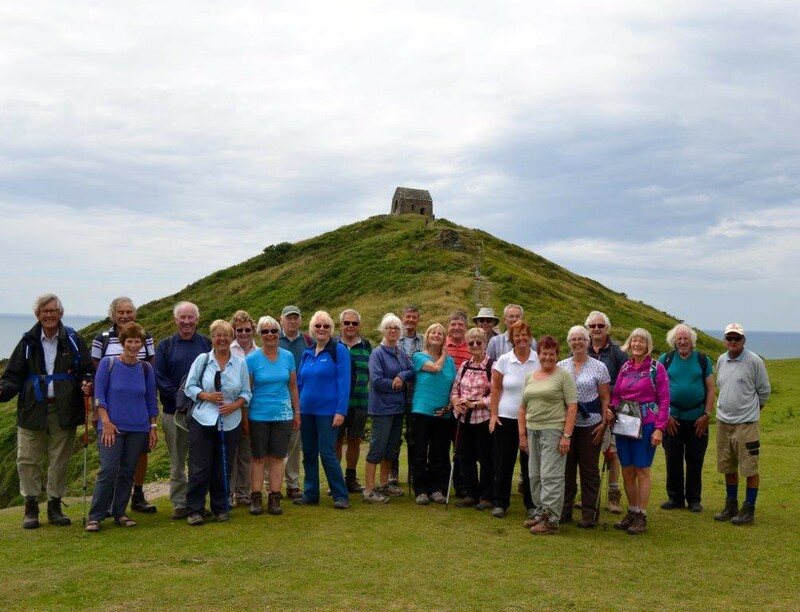 A Happy New Year to all the group and we hope to see you again in 2017 with our first walk on 10th January. 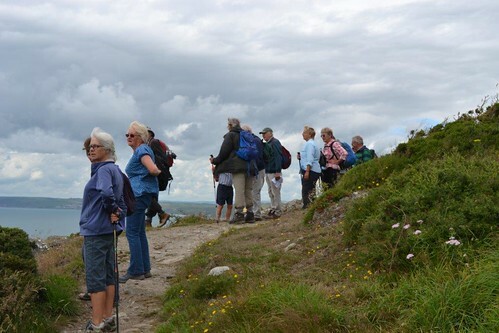 On a day with a forecast of reasonable weather particularly on the North coast seventeen walkers set off from the National Trust car park at Holywell to walk the 5 mile circular walk taking in the coast path and the in-land return route. Turning left from the toilet block we headed towards the sand dunes and tried to navigate a path towards the coast path-we did get there eventually! At low tide a shipwreck can be seen which is though by many to be the SS Francia lost in 1917 as it sailed out of Newquay. There is however some confusion as some reports state that the Francia, a 700 tonne steamer from Argentina, was sunk 4 miles off shore. Also visible off Penhale Point are Carter's or Gull Rocks as the surf roles in on the beach at Holywell Bay This impressive view can be seen in the second series of the popular BBC programme Poldark. Walking northwards to the end of the dunes we pass two tumuli and remains of an old settlement on Kelsey Head with rocks known as the Chicks just off shore. Round the headland we find the delightful cove called Porth Joke where seals are quite often found-it says in most guide books. Well we saw about six enjoying the waves and floating horizontally as they acted like surfers on holiday. After rounding this large finger like estuary we head towards Pentire Point West before somebody remembered that we had not taken our usual photograph. Glyn managed to capture the photo enclosed with the Goose rocks in the background before we turned off the coast path and towards our lunch stop at The Bowgie Inn. Another photo from our walk available here. Most sat outside on the numerous picnic tables with hot drinks and watched the surfers in the waves whereas some ate inside with a roaring open fire-the food and drink provided was all very welcome. After the break with the weather becoming a little cloudier we pressed on uphill and towards Cubert Common and across its western shoulder and over The Kelseys and past the Holywell Golf Club-the location for one of our walkers golfing triumph-and past the sand dunes towards the village again and the car park. During the drive back to Lostwithiel the rain started and the light started to fail early in the afternoon making us feel that we had certainly the best part of the day. BY FRIDAY 9TH DECEMBER IF YOU CAN JOIN US AND IF YOU CAN PROVIDE TRANSPORT. What an excellent day for walking with full sun most of the day and no wind even on the coast path. Twelve of us set off from the car park in Tintagel to walk the planned 3.5 mile circular route. Just a note before we start that the walk was measured after at 3.53 miles-we must be getting better as we used to be up to 2 miles out with our string gauge and a map. down the hill passing the Chapel of Our Lady of Fontevrault on our left before rising up again and over one of many stiles on the walk-most being granite and quite tall for any with little legs. Passing some stables we walked alongside some fenced and well tended fields to come out by Trevillick Farm and with three paths to follow, one of which we tried on the recce only to find a blockage, we walked along the lane to the main B3263 and walked about 20 yds before turning right onto a track again and towards Trecknow. At the entrance to this small hamlet we again turned right to head towards the coast path and a view of Trebarwith Strand and our first photograph with Gull Rock in the background. Heading downhill we also see a sign on a gate “Bluff Centre” which we find out is a modern guest house set on 9 acres of land with sea views. When one comes down you also have to go up and we rejoined the South West Path to go north and the Lanterdan Pinnacle, a tower of uncut rock 24m high, can be seen. This was left by the quarry workers because it contains inferior slate whereas the trimmed and cut slate was lowered to cargo ships that lay alongside the base of the cliffs. Walking again on the path overlooking the cliffs and past the Tintagel Youth Hostel, once the offices of the nearby cliff quarry we followed the path to the church of St Materiana. The existing church may have been created in the late 11th or 12th century whilst the tower may be 13th or 15th century in date. We all had an interesting look around this impressive building before following again the coast path on the seaward side of the church towards the the great headland of The Island and the famous ruins of the monastery and castle and the centre of the tales of King Arthur. After looking down on the site we walked up the steep hill and back to Tintagel and our lunch stop. The photo shows us sitting outside the café, still shielding our eyes from the sun as we decided to sit outside and enjoy the excellent food before heading home with tired legs and full tummies. WE WILL MEET AT COMMUNITY CENTRE AT 9.45AM FOR 10.00AM DEPARTURE. IF YOU CAN PROVIDE TRANSPORT. 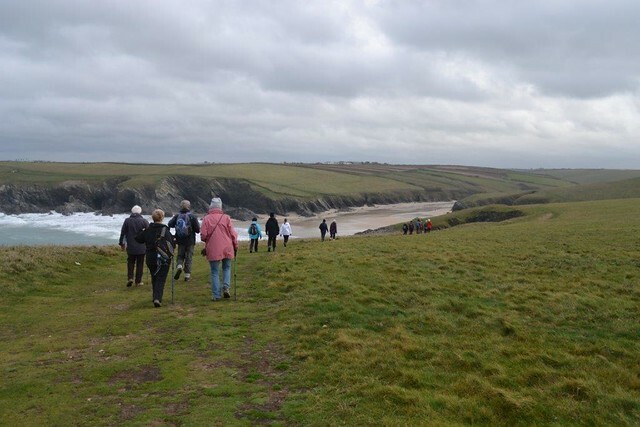 With the weather forecast indicating that heavy rain was approaching Cornwall from the west and that it was expected to hit the north coast at around 1.00pm it was decided to switch the walk venue as the advertised Hollywell walk is very exposed. We decided to reduce our travel time and still give ourselves a National Trust car park, a sea view, somewhere to have a hot drink or something to eat but unfortunately no sand dunes-you can't please everyone! 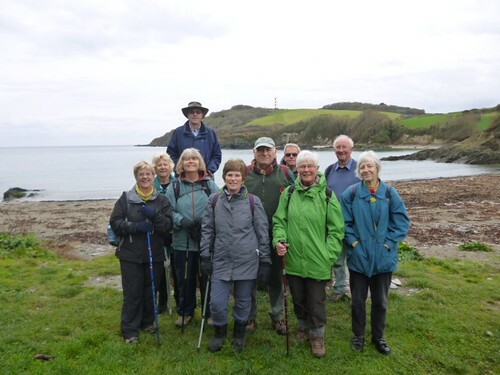 We parked at Coombe Farm just outside Fowey and walked under cloudy skies towards Polridmouth Bay and our photograph stop with a beach backdrop and showing our gang of 10 and one taking the photograph. Turning eastwards above Lankelly Cliff and around Southground Point we walked on the South West coast path with the very calm sea below passing Southground Cliff and towards the remains of St Catherine's Castle and into Fowey and to the harbour side. At about 12.15 some stopped to eat picnics and the others squeezed into the Dwelling House to part take of some delicious food and beverages with an agreement to re-group again at 1.00pm. With some full(er) tummies we left the café with drizzle just starting and headed back towards Readymoney and the shorter route up the slippery path back to the car park arriving back in Lostwithiel at about 2.15pm with the heavy rain predicted now due to arrive at about 5.00pm. I'm not sure how many miles we walked but we all had a good time, some excellent food and good company. BY FRIDAY 4TH NOVEMBER IF YOU CAN JOIN US AND IF YOU CAN PROVIDE TRANSPORT. Eighteen of us set off from the Black hill car park on this walk and historic journey through this area which was designated part of a World Heritage Site in 2006 due to its major concentration of early 19th century remains, the majority of which are the result of the work of Joseph Treffry. He was born in Plymouth as Joseph Thomas Austen to Joseph Austen, a former Mayor of Plymouth and Susanna nee Treffry. He changed his name by deed poll after the death of his mother's brother William Esco Treffry in 1808, when he inherited the family estate at Place House Fowey. His name lives on as we head upwards, cross one of the many leats and towards the Treffry Viaduct. This was constructed between 1839 and 1842 from local granite and was the first stone viaduct to be built in Cornwall and consists of 10 arches spanning 200 metres which rise 27 metres from the valley floor. The viaduct also doubled as an aquaduct -it has a water channel beneath the railway track which was precisely sloped to feed the upper most Carmears leat. Turning left before we cross the viaduct we walk on the old tramway with the granite blocks and in some parts the old rails still present. We then pass an old ruined building with large stone fireplace still intact and head downhill till we come to the site of a large wheel pit built in 1841and used to haul wagons up the incline until the 1870's. After this date it was re-purposed to grind quarried china stone a material used,mixed with china clay, to form porcelain after kilning. Again turning left and going uphill we pass a part of the 2 mile long watercourse constructed by Treffry in the 1820's to supply water to his Fowey Consols copper mines on Penpillick Hill. After a short break to admire the view of the sea from this high point we head downhill past a fenced off mineshaft, the mineshaft being part of the Prideaux Wood mine one of the copper mines consolidated into the group of 5 known as the Fowey Consols. These were the considered to be one of the deepest, richest and most important of the Cornish copper mines and employed some 1680 people. We then continued to reach a flight of steps departing to the left at a wooden post-the instructions then say “at the post keep right to stay on the path”. However we did go down these steps to realise at the bottom that something was not quite right. With knowledge from some fellow walkers we pressed on and although we missed walking alongside the River Par and the clay dryers we were soon back at the car park. The dryers will I'm sure feature in a further walk in this interesting location so those walkers with extensive knowledge,you know who you are, should be ready to answer some difficult questions. We will meet at Community Centre at 10.00am for a 10.15am start. 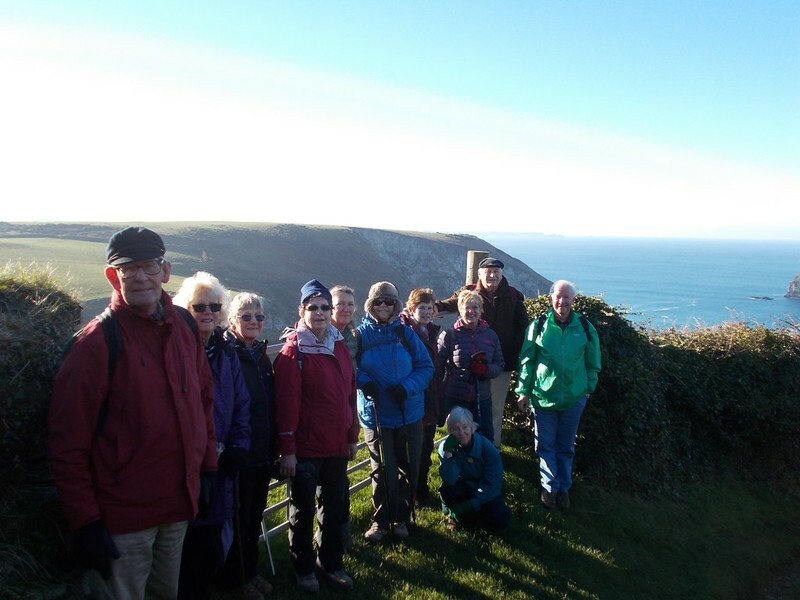 Fourteen walkers set off on this bright autumn day for our walk around Minions. For the morning part of the walk, we did the 4 miles walk around Caradon Hill, starting just beyond the Cheesewring Hotel where we turned left on a public footpath opposite Edgemoor Cottage. It is on the whole an easy walk, much of it on old tramways. 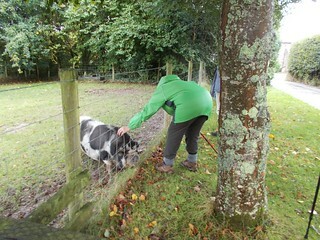 The only obstacles we had to negotiate were a wooden stile, a stone one and a crossing over a very clear small stream. We were lucky that, so far, we have had a dry autumn. Having done this walk in January, the main obstacles I had faced were the knee deep mud which meant several false starts and an impassable fast flowing stream! Choose your month carefully if you decide to do this walk again! This area, which is of great natural beauty, was the centre of a Victorian “copper boom”. The first part of the walk is a fascinating mixed of ruined engine houses, spoil tips, devastation and a strange attraction. Because nothing grows on the spoil tips which contain arsenic, you have the impression that the mines were abandoned yesterday. Very eerie indeed! After approximately one hour, we arrived at the car park at Tokenbury Corner which is an alternative starting point and where we took in the beautiful views down the valley up to Kit Hill, East Dartmoor and also to the sea (Rame Head?). We then proceeded on the track which is parallel to the road and then walked on a former railway track which runs behind Caradon Hill. We had lunch at the Hurlers’ Halt and at 2.00pm Pat Fitzsimmons of the Geology Group of the Saltash U3A joined us for what turned out to be a very informative guided walk. 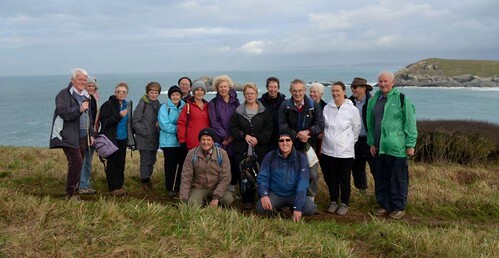 The Saltash U3A led a recent community geo-archaeological project called “Reading the Hurlers” to survey the area around The Hurlers to identify the locations where the stones of The Hurlers were quarried from. Did you know that the name comes from the legend that tells of local people being turned to stone for playing hurlers on the Sabbath? The close grouping of three Late Neolithic or early Bronze Age stone circles is extremely rare in England but a grouping of three such regular circles is unique. Pat told us about the “Mapping the Sun” project which took place in 2014 and which revealed a “pavement”, a strip of granite paving between the northern circle and the central one. The “Reading the Hurlers” project also aimed to uncover a fourth stone circle. However, there is no fourth circle and all there is a standing stone, which is visible. Pat took us to see Rillaton Barrow, a round cairn which stands 500 metres north-northeast of The Hurlers stone circles on a rise of land known as Rillaton Moor in an area rich in round barrows, cairns, standing stones and natural rock features. It consists of a mound of stone and earth that has a diameter of over 35 metres and stands over 2.5 metres high despise a crater dug into its top by stone robbers. What is most interesting though is a slab lined cist on its eastern side and what it was found to contain. This cist which is aligned north-south and is about 2 metres long by 1 metre in width and height was opened by in 1837 by workmen looking for building material who found a skeleton along with a bronze dagger, several faience beads and a decorated pot that contained a corrugated gold cup with a riveted handle. This spectacular find, now known as the Rillaton Cup and thought to date from 2000-1500BC, was handed over as treasure trove and found its way into King George V's dressing room where he is said to have used it for storing collar studs! It is currently in the British Museum and was thought to be unique in Britain until a similar but partly crushed gold cup was found at Ringlemere in Kent in 2001. By the end of Pat’s guided walk, it was 3.00pm and as the wind had picked up we decided to call it a day. We will do the walk around the Cheesewring on another day. OVERALL, THE WALK IS A MODERATE ONE (SOME OF YOU MAY CHOOSE TO CLIMB UP TO THE CHEESEWRING (AND BACK DOWN!). There are only 2 stiles (a wooden one and a stone one). WE WILL WALK ON A RANGE OF SURFACES: MINERAL LINES TRACKS, SQUIDGY MOOR, ACROSS ONE OR TWO STREAMS AND ON SOME MUDDY FOOTPATHS. I RECOMMEND THAT YOU WEAR STURDY BOOTS AND BRING YOUR STICKS. Contact me by Sunday 9th if you would like to join this walk (you can do the morning walk only if you choose to) and if you are able to offer transport. Thirteen of us set off from the Community Centre car park at 11.00am; a little later than normal in order to arrive at St. Winnow in time for lunch at Angie's burger van. 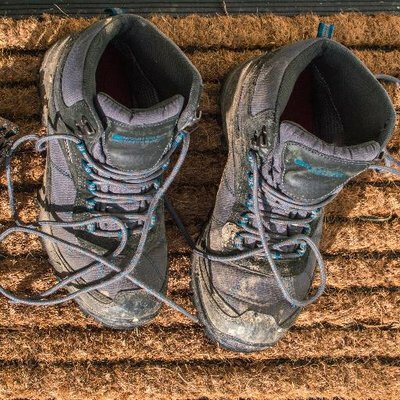 This 3.5 mile walk uses minor roads, footpaths and across fields. Although we were all prepared for showery weather and it was a bit disappointing as we set off in a light drizzle- spirits and expectations were high. It was a relatively easy walk to St. Winnow starting with a moderate hill past Lanwithan and towards Polmena. The trickiest part was the short rocky pathway from the entrance to Newham and then a short waterlogged stretch where Annie found the dry route. 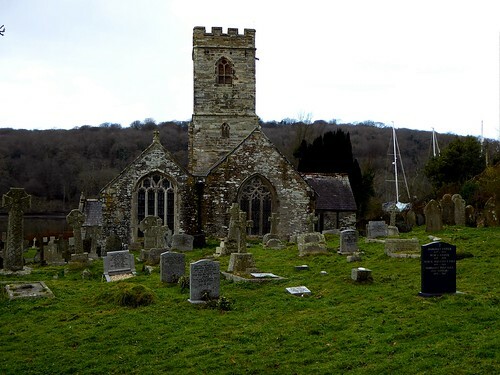 We then turn right over the fields and through the woods to reach the boatyard at St. Winnow and the churchyard. 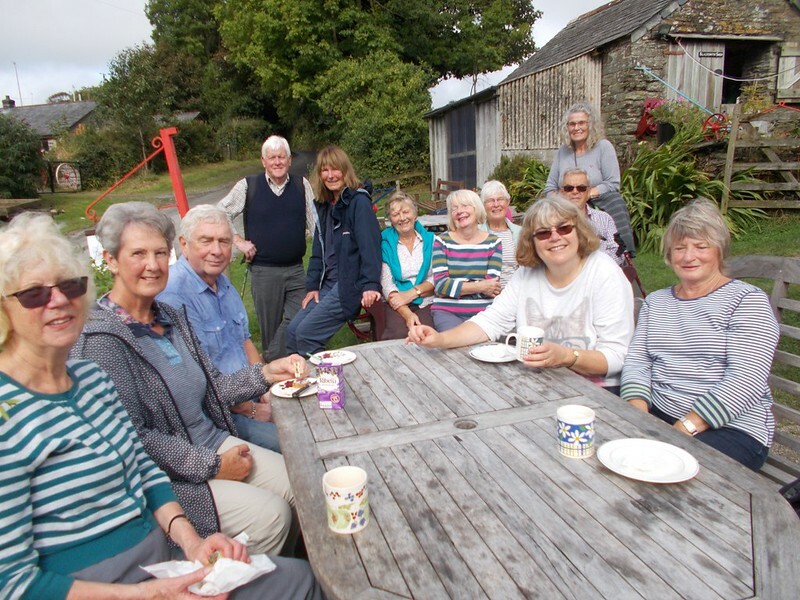 Although we had a few light touches of drizzle along the way by the time we reached St. Winnow we were able to sit and enjoy our lunch in bright warm sunshine. Nearly all of us succumbed to Angie's food and in particular to the roast pork rolls which proved the most popular. Very good it was too. Our return route took us uphill past the old vicarage and to the rocky path through the waterlogged part and then uphill. 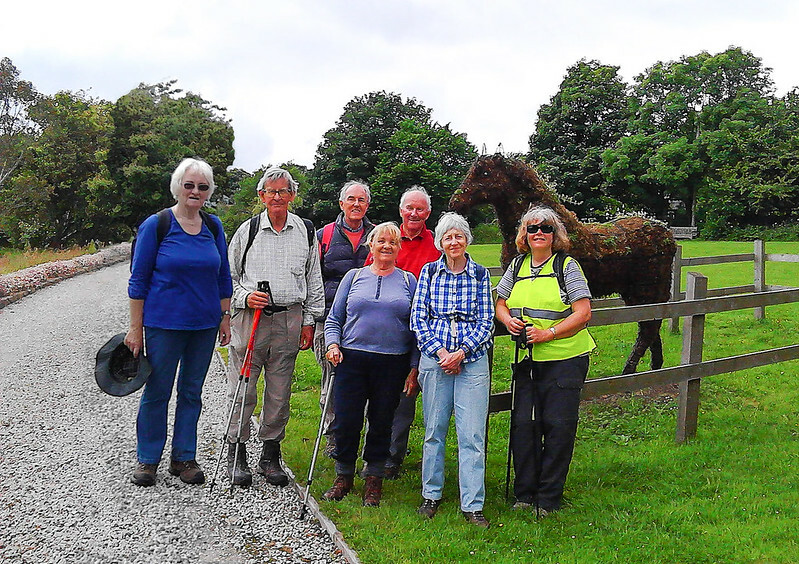 The next part surprised a few people as we are now able to turn right half way up the hill and through fields to Tredethick farm cottages and then back down the main Lerryn road after stopping to admire the pot bellied pigs and llamas at the farm. 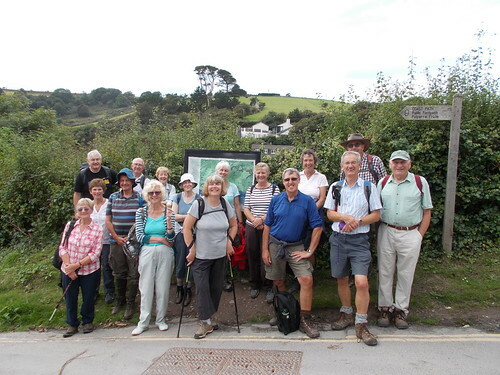 After a very enjoyable morning we arrived back in Lostwithiel at about 2.30pm. 4) Take a look around the church or farm museum. We will meet at Community Centre at 11.00am. If you could let us know by Sunday 25th if you want to go on walk. No transport required. After delaying the start of the walk by 1 hour due to a bad weather forecast for early in the day seventeen of us mustered outside the Sawyers Guest House at Hannafore to catch the 11.43am bus to Polperro in the now hazy sunshine. The bus was about 8 minutes late and by the time we reached the Crumplehorn stop in Polperro very full. Most of us were able to use our bus passes but “Young David” as we will call him had to spend about half his pocket money (£2.95) on the single fair. Walking down into the old fishing village of Polperro towards the harbour and the small cottages in narrow streets we pass many pasty shops and tea rooms which we all resisted to join the South West Coast path for the 4.5 mile walk to Looe. This is a very pleasant walk with many ups and downs and steps which I had failed to mention in my introduction to the walk(can I put it down to age?). We had good sight, as we left the harbour, of military manoeuvres in the bay with two helicopters and a navy vessel involved. Our first realisation after a short walk was that the foot path before Talland Bay had not been reinstated since the storms of 2014 which meant that we had to do a slight detour and walk down the long road into the bay and our lunch stop. For some it was the café and for others a picnic on the beach. A pity we had not brought our swimming stuff as by this point it was hot and humid with sun and little wind. Starting again, after use of facilities and a photograph-not at the same time, we continued on the coast path around Hore Stone and with Portnadler Bay on our right our first view of St George's or Looe Island. The island, the former home of the Atkins sisters who purchased the 22 acre island in 1965, was left to the Cornish Wildlife Trust who preserve the island as nature reserve. Two wardens live on the island and look after the day to day running and care of the sheep and monitor the bird life which nests on the slopes. 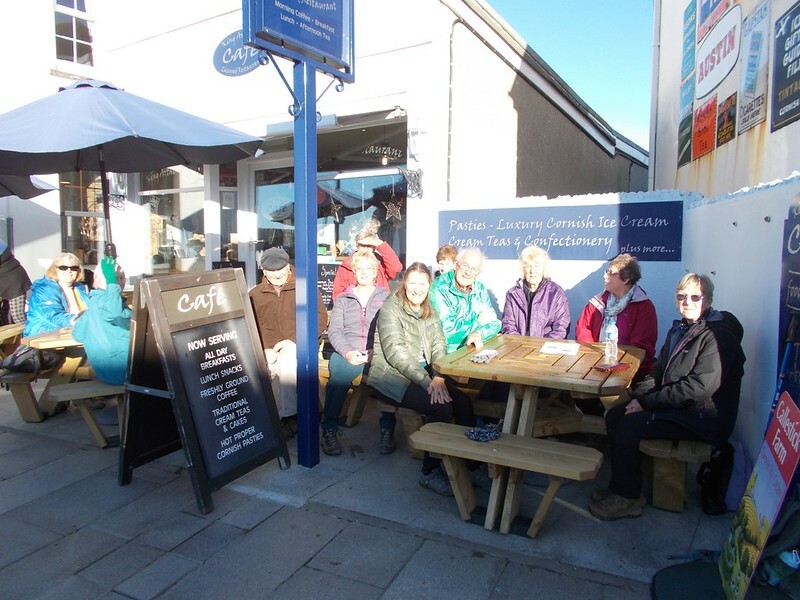 After a few more hills we arrive at Hannafore and a nice sea breeze with many people sat on the chairs and enjoying what has turned out to be an excellent sunny day with none of the rain forecast. This is a repeat of a walk we first did in April 2014 after the storms had taken away part of the coast path above Talland Bay and sixteen of us including many new members at the time had an enjoyable walk. 3) We will lunch at Talland using cafe or picnic. Swimming a possibility? 4) Possibility for cream tea at Looe on return. We will meet at Community Centre at 9.40am for 9.45am depart to ensure we catch bus. If you could let us know by Friday 9th if you want to go on walk and if you are able to offer transport. Just to let you know this is taking place between 10-18th September organised by Looe Tourist Information Centre. 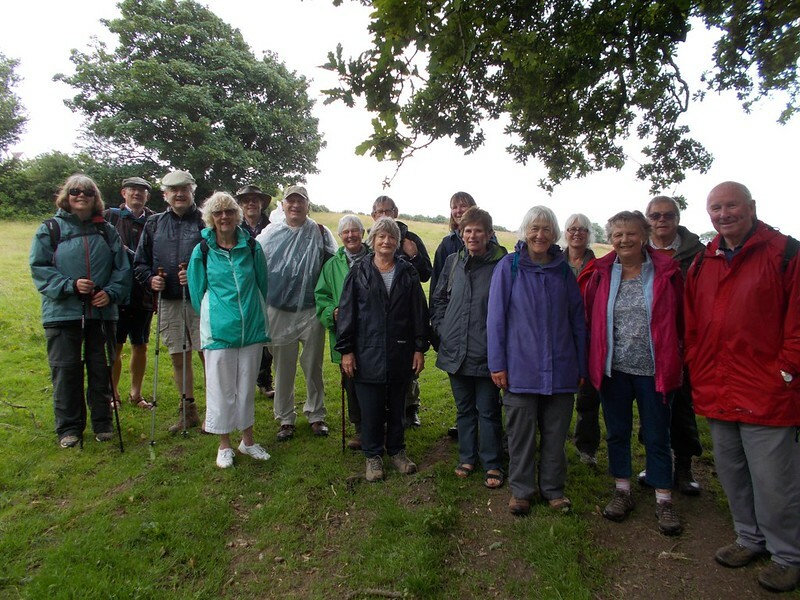 THIS IS NOT A U3A ORGANISED WALK BUT SEVERAL OF OUR MEMBERS TOOK PART LAST YEAR AND ENJOYED THE DAY. Cornwall at its best-as one of our group said as we looked out on Constantine Bay as eighteen of us set off at the start of our walk. The sky was blue with hazy sunshine, the white surf breaking over the golden sand as we looked ahead to walk the half mile along Constantine Bay towards some steps which lead over a rocky ridge and above Booby's Bay. At very low tide the shipwreck of the SV Carl can be seen in this bay, the vessel was in Cardiff Docks in 1914 when war broke out and was impounded by the authorities. Three years later it was decided to tow her to London and during the operation the vessel broke free during a storm and it grounded in the bay. Keeping left along the clifftop path we see the giant Round Hole where you can hear and with great care see the tide rushing into the deep hole. Not venturing onto Dinas Head we go onto Trevose Head; an area recently in the news as it has been purchased by the National Trust. It is an area designated as a site of Special Scientific Interest for its geological and biological attributes. Passing the car park near the impressive lighthouse which was first lit on 1st December 1847 and more recently a new horn was installed in 1963 and the lighthouse was fully automated and became unmanned in 1995. Continuing east along the cliffs and above Chairs Rock and Merope Rocks we come to Trevose Head Lifeboat station the current home for the Padstow Lifeboat. The station was re-sited to Mother Ivey's Bay in October 1967 from Hawkers Cove due to the river silting. The boat can now launch into deep water at any state of the tide. The station with its impressive shape roof makes an ideal backdrop for another group photograph. Passing Mother Ivey's Cottage and the broad expanse of the bay we press on to Cataclews Point and,with three good benches and a view over Harlyn Bay, an ideal lunch time stop for our various picnic treats and revelations of some programme on Channel 4-looks like we will have to wait until next Monday. Walking along the very busy Harlyn Bay a popular surfing venue with large car park, which some of our group had already visited, we cross the bridge to make our return journey but not before comfort breaks for some and ice creams for others. Wearing our reflective jackets we walk along the road before using footpaths to cut off some of the road and go through the grounds of Harlyn House to aim for the golf course and club house to return to the cars. The mileage was assessed by our experts with gadgets as between 5.75 and 8 miles(for those with short legs) so our initial indication of 6 miles was considered a success worthy of applause. An excellent day for walking with mottled sunshine and slight breeze as 14 of us met in the car park on top of Wiggle Cliff after getting there by various routes. The cliff lives up to its name by providing food plants for a range of caterpillars which can be seen as butterflies in summer. We continue on this path and into a field onto Rame Head an area of Outanding Natural Beauty (AONB)- an area included in one of the 33 regions in England with that designation. There is a single Cornwall AONB which is itself subdivided into 12 sections. Onto the path which leads to a rock outcrop from where you have great views across Whitesand Bay and on the opposite side Looe and Looe Island was just visible on this clear day. We now head for the chapel on the headland and just as we try and decide who wants to walk to the chapel on a short detour we meet a U3A Walking Group from Saltash who have just come from Kingsand. A group photograph seemed a good idea. The chapel is dedicated to St Michael and was first licensed for Mass in 1397. We then travel east passing the path to the National Coastwatch Station-similar to that seen on our last walk from Charlestown. This is one of 50 stations around England and Wales which is run by volunteers. The next major landmark is the wreck site of The Coronation a 90 gun man-o-war built towards the end of the Stuart period and which capsized in 1691. Much naval activity can be researched along this coast line and we saw two frigates and a helicopter taking off whilst on our walk. We were soon into Cawsand a delightful coastal village just next to the equally delightful Kingsand. Until 1844 the border between Celtic Cornwall and Saxon Devon lay between Cawsand and Kingsand and the boundary line can still be seen on the side of the building. 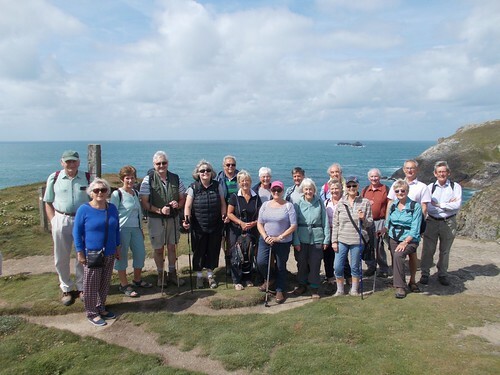 We then all had a good and very welcome lunch fish and chips, pasties, ice creams-some with flakes, scones-some with cream, toasted tea cakes-some with extra butter, crab sandwiches----what a treat for all-all we have to do now is walk back to the car park. Past the gun emplacement and up the steps and then more steps to the fields above the towns and to the driveway to Wringford Farm. From here we pass by an old bunker, the bottom of someone’s garden and along the lane from the hamlet of Wiggle to the car park. A great walk which we all enjoyed and measured at 6.2 miles. A further treat was also in store for 5 lucky walkers who did not have to return home immediately-a drink and home-made cake supplied by Sue and Rob and a tour of his garage and workshop. Our next walk is on Tuesday 9th August-further details to follow. PLEASE LET US KNOW BY FRIDAY 8TH JULY IF YOU ARE ABLE TO COME AND/OR OFFER TRANSPORT. On what is becoming typical of many walks this year 21 of us set off in weather which was forecast to become worse with the prospect of heavy rain blowing in later in the morning. In view of this we changed to plan B and decided to do the walk straight away and have a drink after the walk. 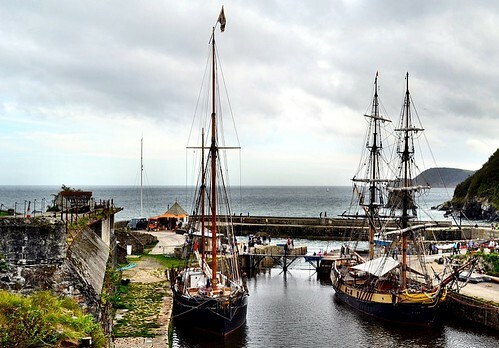 We all managed to park in Charlestown, although some had to walk further than others, and headed off to the harbour to find the coast path going east. There were 2 square riggers in the harbour but no film makers on this occasion. It is hard to believe that as recently as the 1950's you would have been walking through a thick coating of white clay dust and that the house fronts would have also been covered. Clay was carried down to the port along the wide road from St Austell, firstly in horse drawn carts and latterly in lorries to be tipped down wooden chutes into the waiting ships. © Copyright Trevor Rickard Creative Commons Licence. We turn left where the public conveniences used to be and if we look behind towards the wooden knoll overlooking the port that once held a defensive battery and along the coastline towards Black Head, a 500 year old Bronze Age cliff fort. We followed the coast path until passing the rear of Carlyon Bay Hotel and continued along Sea Road admiring the many examples of 1930's architecture. After passing the Porth Avalon Hotel we first missed the sharp turn and then retraced our steps to go between two high hedges until we reached Beach Road. Looking behind us it is incredible to think that this area of manicured suburbia was up to the 1950's an area of mining spoil tips and riddled with shafts. We continued until we reached a grassy triangle and turned towards a house named Anneth Lawen (Cornish for happy joyous place). Travelling on the old mining track constructed in the 1700's for exporting tin to South Wales for smelting and by passing West Polmear Farm we exit onto Higher Quay Road and back to the start. Eight of us manage to find somewhere comfortable for a drink and snack as the rain begins and we are pleased that we did not stop for a drink at the start. As usual this year there will only be one official walk in July and August and back to the normal short and long walks in September. TO OFFER TRANSPORT OR IF YOU WANT TO GO DIRECT TO START. Seven walkers, optimistic that the weather would be kind to us (and it was), set off for this walk having driven from Lostwithiel to a spot with free parking in Hay Hill Close in Fowey. From Hay Hill Close, we took a footpath that runs from the Meadow Views flat complex down the road to the Bodinnick Ferry (B3269); we turned left onto that road and joined the Saint’s Way having turned right onto Penventinue Lane. 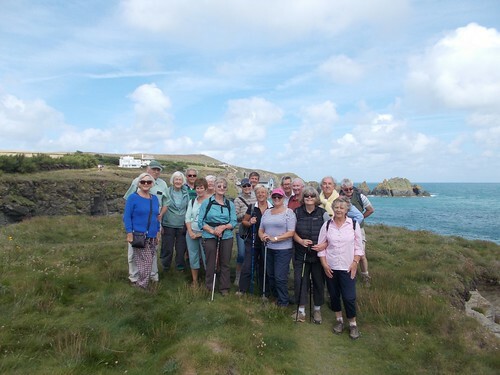 The Saint's Way, or Forth an Syns, is a long-distance footpath that cuts right across Cornwall from Padstow on the north coast to Fowey on the south. Roughly 27 miles long, the route only came to light in 1984 when local ramblers investigating public paths found a series of forgotten granite stiles. The footpath features historic remains, ancient footbridges, old tracks and fascinating churches and passes through a rich and varied landscape of valleys, woodlands, pastures, moors and ancient field systems. You can reach Golant by walking on the upper or the lower footpath. We used the former on our way to Golant. 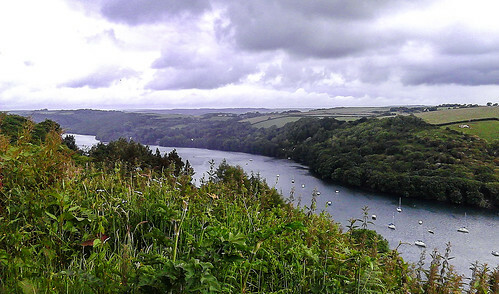 The vegetation was very lush and when we reached the top of the ridge, we got stunning views over the River Fowey, Penpol Creek, Cliff and St Winnow Point. In the distance, we could see one of the ospreys nesting platforms erected in the land owned by Haye Farm on the bank of Penpol Creek thanks to a project led by the Friends of the Fowey Estuary (we actually saw them better on the way back). We had a choice of venues for our lunch break: the Cormorant Hotel, the Fisherman’s Arms or the green. The sun was not out, so unfortunately we could not put to the test the Human Sundial at the south end of the green which was designed, crafted and built by villagers out of local slate in celebration of the millennium. Our return journey along the lower path took us past the creek where Sawmills, the recording studio is situated. We thought that the property had become a holiday cottage but in fact it is still operating as a studio. Here is the information that can be found on their website: “The Sawmills was established in 1974 as one of the first residential recording facilities in the U.K. Set in its own unspoilt tidal creek on the banks of the River Fowey in Cornwall, the Sawmills boasts one of the most picturesque and atmospheric locations for a recording studio anywhere in the world. The main building is a 17th century water mill; the site has a documented history stretching back to the 11th century. 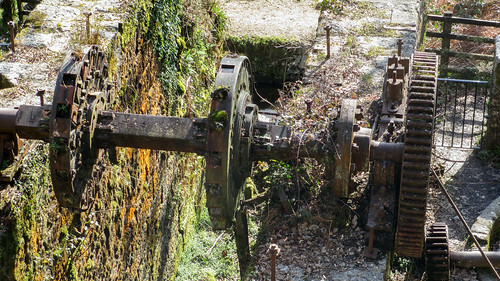 Over the past 3 decades the Sawmills has evolved into a unique balance between modern technology and the outstanding natural beauty of the Cornish countryside to produce a perfect environment for creative work. Recording artists from XTC to Robert Plant, The Stone Roses to Oasis, The Verve to Supergrass and Muse, have all remarked on and benefited from the special creative atmosphere that the Sawmills provides”. 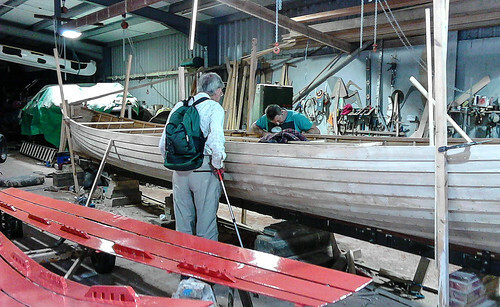 As we approached the final stage of our walk, thanks to one of our fellow walkers John Smith, we were able to have a look inside Hunkin Boatyard and the staff talked about the two gigs they were working on: a new one commissioned by the Royal Marines based in Plymouth and an old Newquay gig that they are restoring. The new gig is made of elm which comes from Sweden. In summary, here are some statistics on our walk provided by Tony Smith and Chris Short and their mobile phone Apps: duration including all stops 3hrs 24min; distance 4.8 miles; height gain 851ft; maximum altitude 306ft; minimum altitude 32ft; calories used: 570. And if I may add: stiles: 0! Chris and Janet will be back to lead the next walk scheduled for Tuesday 28th June. Distance and timings: semi circular walk of 5 miles. 2 hours 45mns plus lunch break. Some uphill sections. Lunch and Comfort break: In Golant. Bring a packed lunch. However, food and drinks are available in the pub. PARKING: I will give drivers directions to free parking at a location where there is a footpath which joins the Saints Way. Fingers crossed that the lovely weather continues.